That sounds pretty good. My rear tire just barely rubs the shock body and it's a little closer, so you should get by without any rubbing, or at most, very little rubbing. Forgive my crude paint skills but this is to give an idea as to what I would like to do to the frame. I will allow me to mount the shocks under the frame straight up and down to keep from unloading too much while side hilling. 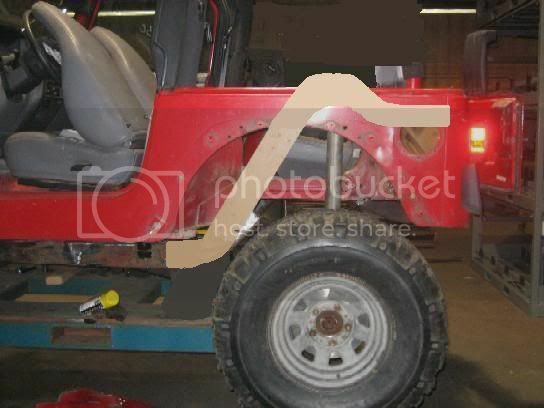 The frame will still continue straight side to side and allow me to put c/yj wheel wells with a bump on top for the frame and put a cj rear seat in it. I think the frame should be strong enough to do this it is 4" tall 2.5" wide with roughly 3/16" thick walls and a couple crossmembers. 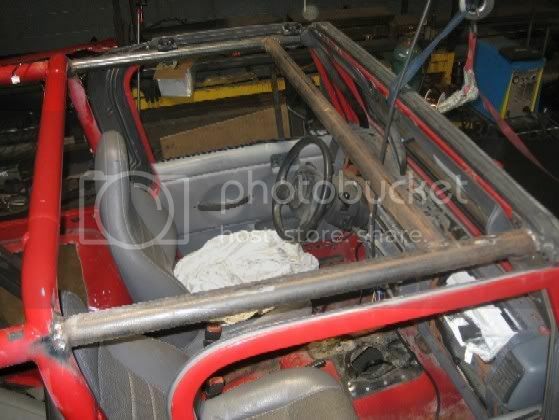 Plus I will have added strength with the cage tied to the frame. Just trying to think outside the box a little, anyone can cut holes in a tub and run a jungle gym in the back. 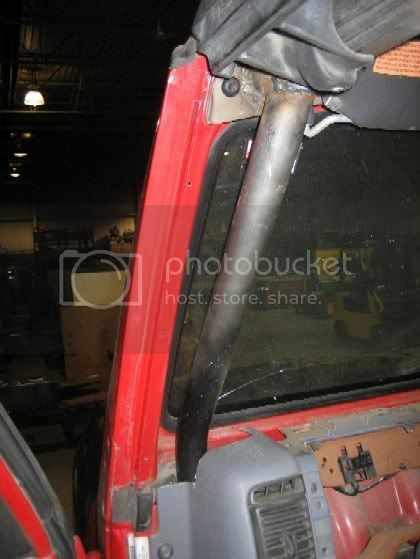 I just think it would be cool to have a capable long travel suspension and not have to cut up the interior of the Jeep. Call me crazy I guess, I'm sure people thought the Wright brothers couldn't get a plane to fly and they did, so we'll see what happens. 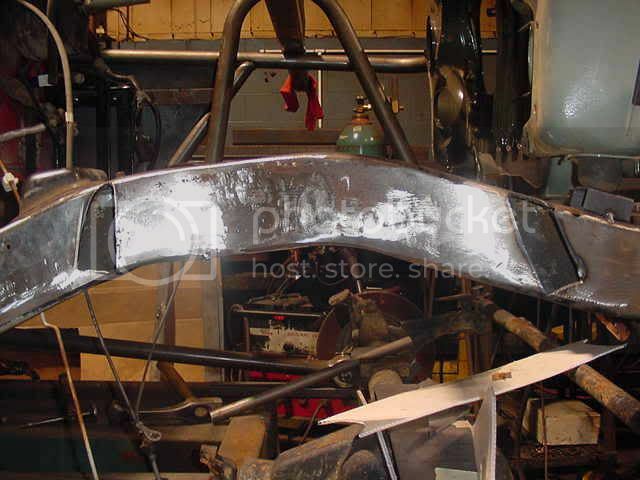 The rear frame horns will have a bracket on it to tie the rear corner of the cage to them. The cage will be tied into the frame and I will put downtubes in the front so it will be the typical 6 pt cage til funds allow for a new cage. Last edited by TJontherox; January 18th, 2007 at 09:11 AM. 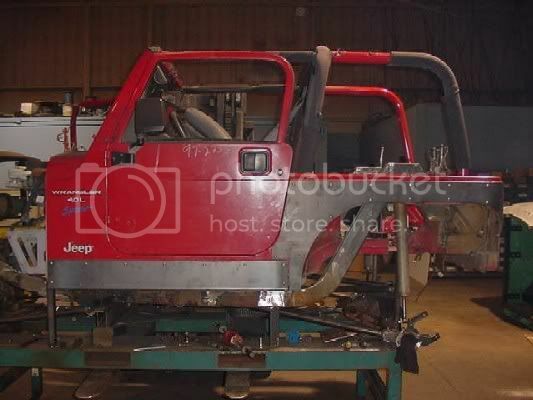 Got some rear frame rails made up now. 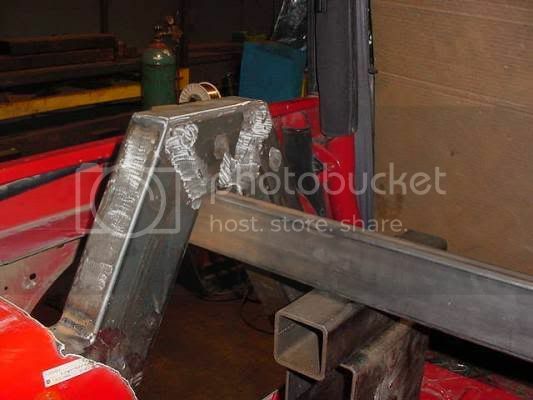 They are the same height, width and thickness as the factory frame, so they should be strong enough. 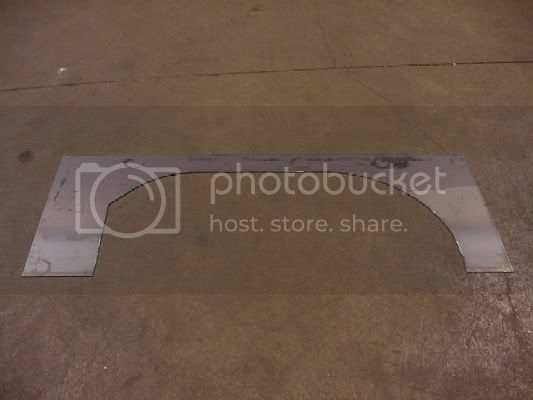 There is a plate running behind the mitres to tie the three pieces together. All the little dots are plug-welds to a piece of 3/16" plate along with the joints welded. This is what the frame looks like from the side now. Little goofy but functional for my needs. When the body goes on it won't look that much different. 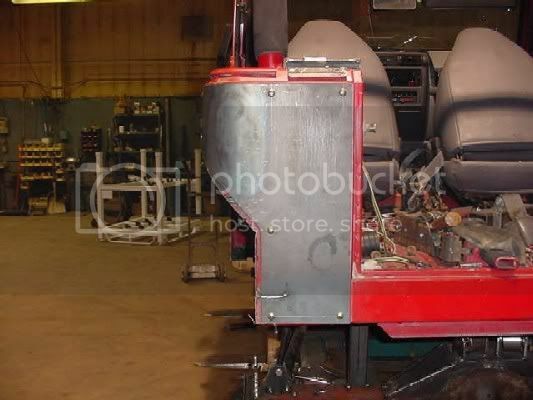 The mock up shock will be centered in the upper part, it is just leaning in there to give an idea where it will be. All the little dots at the radius of the factory frame are going to be more plug-welds to 3/16" plate just like at the top, both the inside and outside of the frame rails. 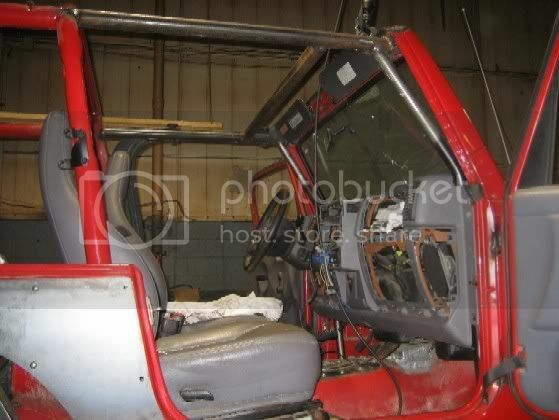 This is what it looks like from the side with the body on it. 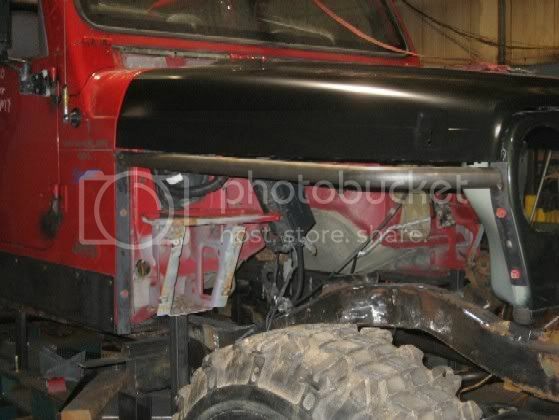 When the frame and inner wheel well are painted black you'll hardly notice the frame. The rear frame horn will have a bracket to tie the factory cage to the frame. Pic from the inside. 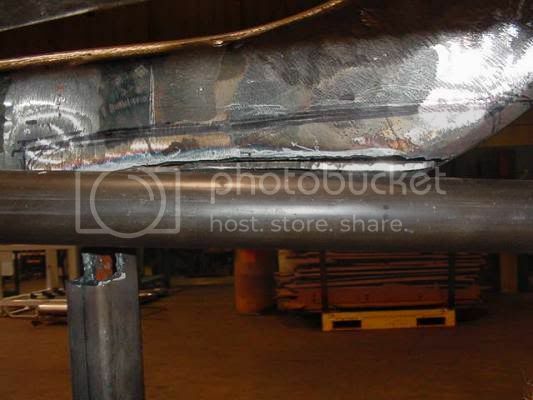 The tube under the frame is only there to hold the the new frame on place. 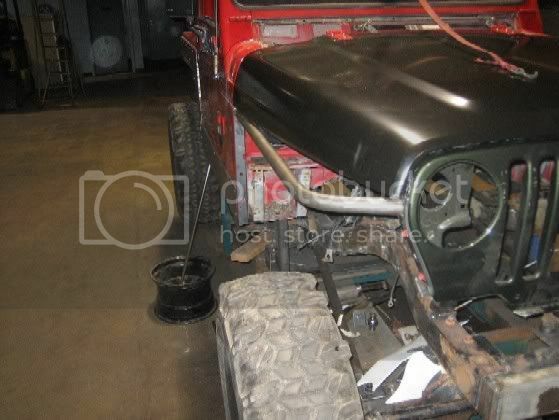 I plan on putting YJ/CJ fender wells in it to finish of the rear of the tub. 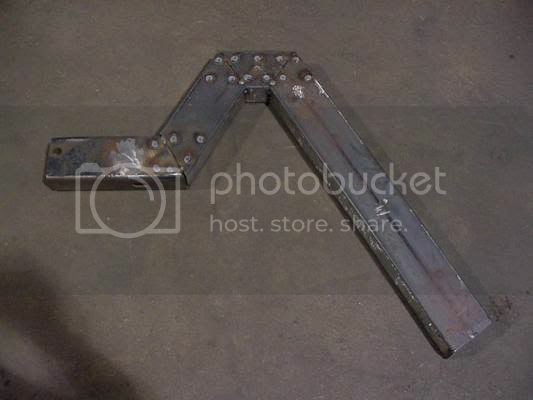 The top 5" of the frame rail will poke through the top of the well. 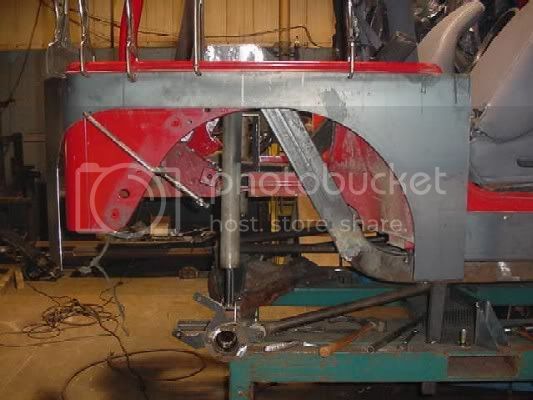 With any luck I may have the rear about 90% mocked up and ready for the complete weld. At least enough to move to the front to make shock hoops and get this sitting on all 4's soon. 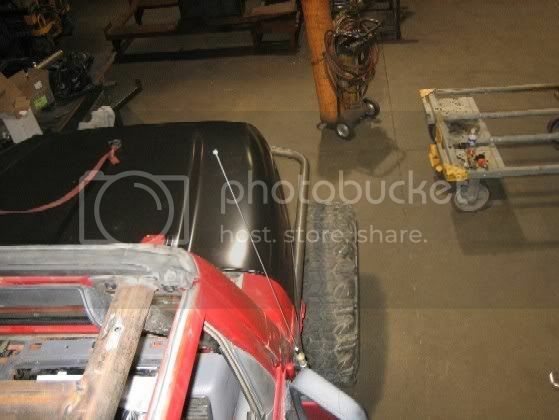 thats allmost exactly what i was planing to do to my tj later on. The blank cut out before bending around the rear corner of the tub. Crushe corner clamped in place and partially bent around the rear of the tub. Completely installed corner with comp cut. The old skin of the tub will be beaten over to make a factory looking flange. I haven't decided on what tail lights I want yet to have to cut the hole. That will have to wait for a later time. I know I'm gonna get LED's Though. 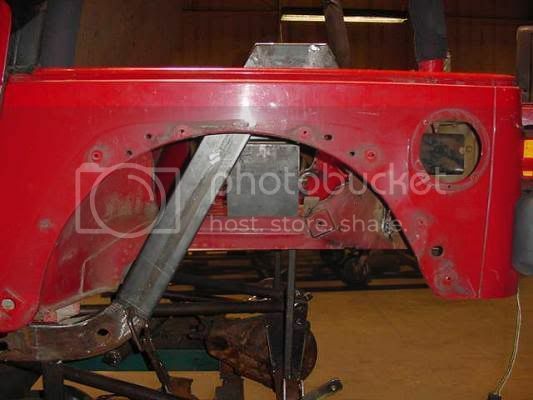 I also had to cut my underside of the frame rail a bit to allow the control arm to get full suspension movement. 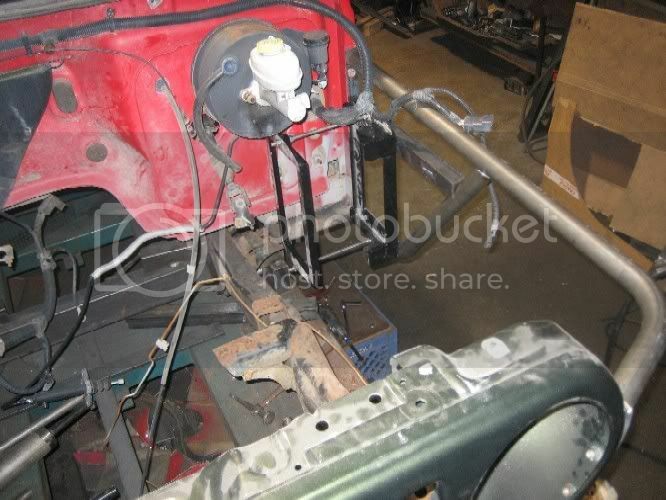 I only have 4" up-travel but the control arm would hit if I didn't notch it a bit. It now has clearance for 6" up-travel. You are frikkin sweet. I strongly admire the fact that you know how to do all of this. The rig is badass!!! I got my cage all finished this weekend. First time using a tube bender, turned just as I expected. I know most of the stuff I'm building for this could be bought, but I get more satisfaction out of building it myself, plus I don't have the money to buy all the parts off the shelf. I also started bending up my tube fenders. I hope to be done fabbing these up tomorrow. 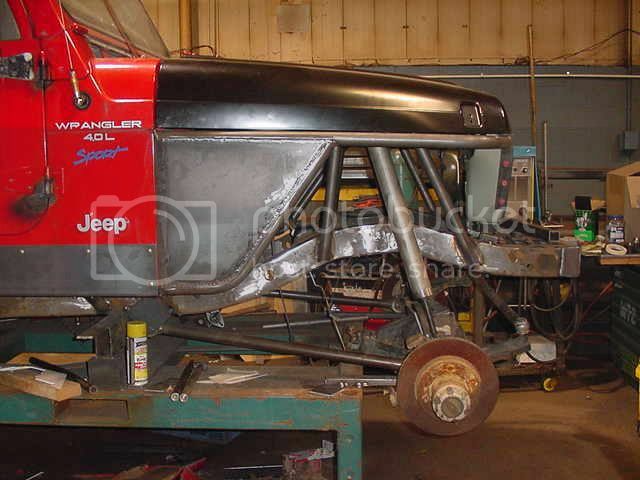 I can't say I understand the frame thing, but its evident by the rest of it that you know what you are doing, very interesting build, keep the pics coming. 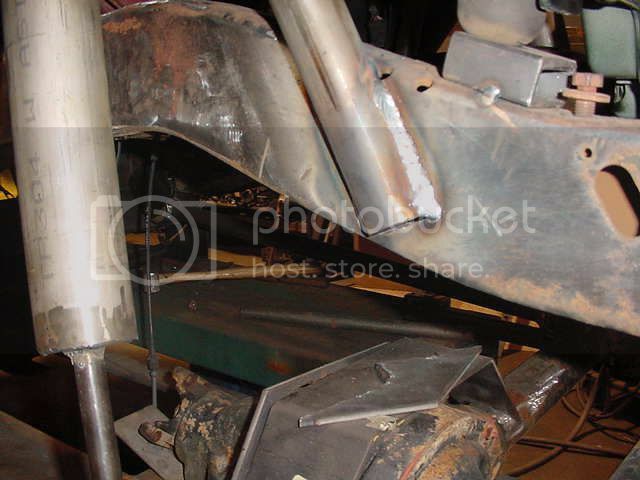 I built the frame like that to put the shocks directly underneath the frame. I wanted the frame to support the entire weight of the rig. I was originally going to tie it into the roll cage but didn't feel that it was strong enough to support the weight of the rig. I am running 2.5" 14 inch travel fox shocks. Finished the tube fenders up and made my front shock hoops today. 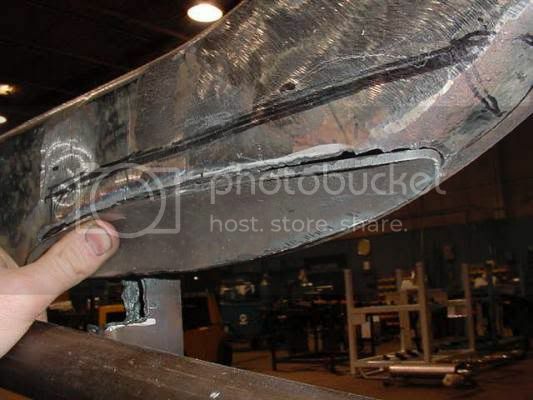 pic of the battery bracket on drivers side. I have the same bracket for the other side as well. I have dual Optima yellow tops going in this. With a battery on both sides it should help distribute the weight evenly. Pic of the cutouts for my shock hoops. I know there are other/simpler ways to do it, but I feel this is stronger than most setups you see. 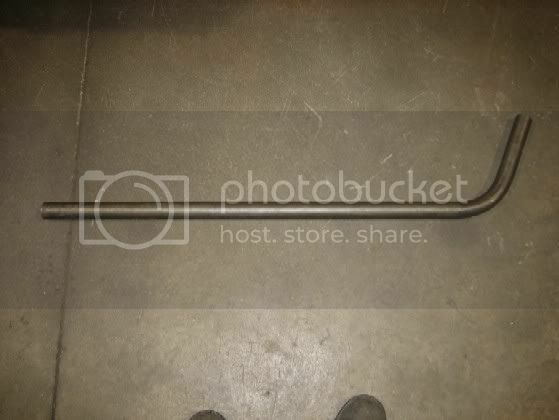 I sunk the tube halfway into the frame and welded around it. Should be more than strong enough. Finished product with the hood down. 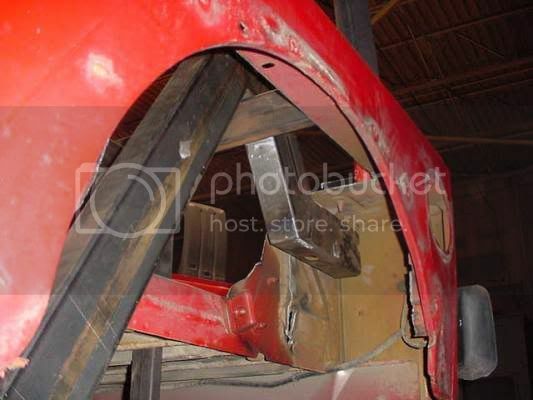 I will run the typical spreader over top the engine on the hoops as well. Last edited by TJontherox; March 3rd, 2007 at 03:16 PM. Finally now have a chance to work on this a bit. Got a little busy at work and had no room in the shop for me to work after hours. Some plans have changed on it since it was put away and the brought back out. Rear bumper and things like that will change. 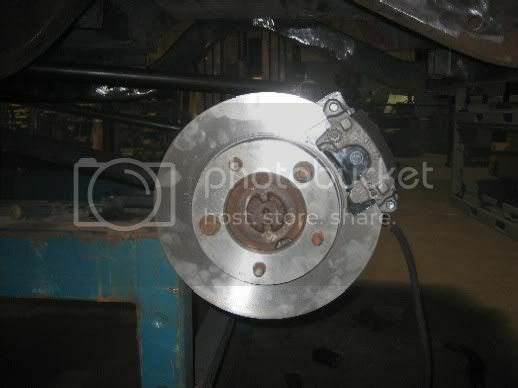 I started back up by converting to rear disc brakes. 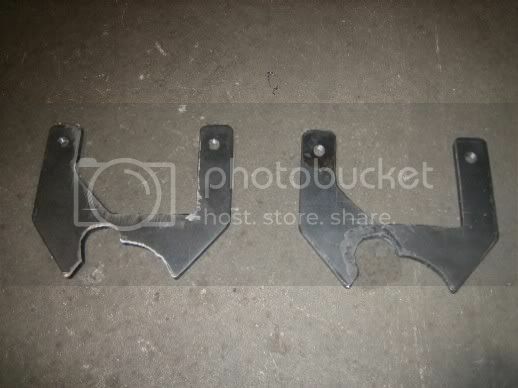 Caliper brackets made out of 5/16 sheet steel. 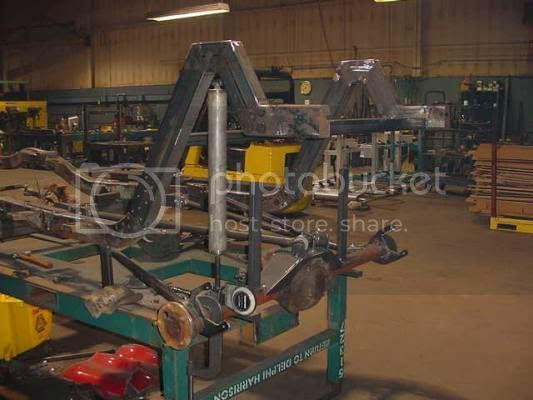 I know the axle is a little rusty, I may have them blasted along with the frame before paint or powdercoating. Haven't decided on the finish yet, long way off for that. 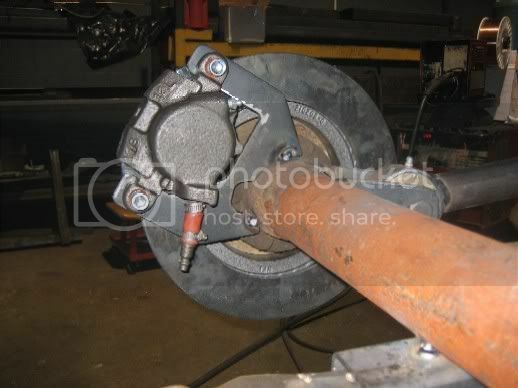 I used S-10 calipers and CJ front discs with the axle flange turned down to fit in the rotor. 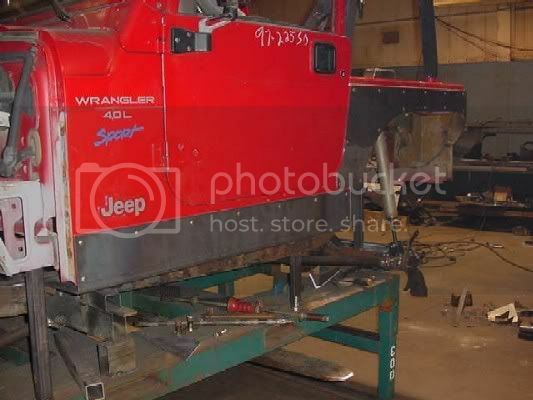 How are you planning on making sure the rear caliper brackets are square to the rotor? 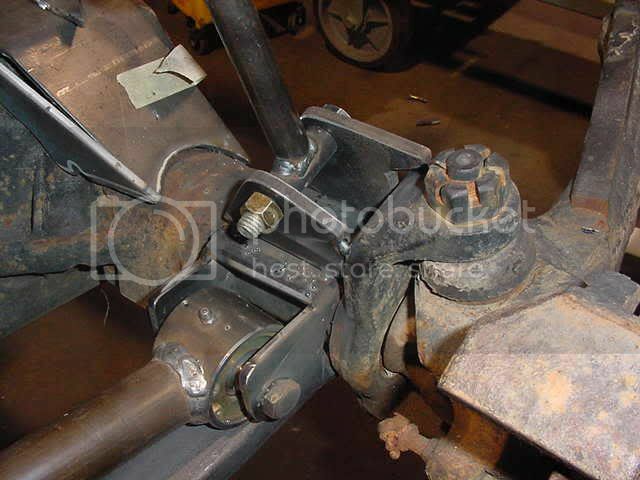 Lower the control-arm mounts on your front axle. You need more seperation. I thought it would be fine and I just had to cut mine off and lower them because the axle was "wrapping" with hard braking and generally felt unstable. I lowered the mounts below axle centerline, and the difference was incredible. Do it now, while its easy. Actually the pic is decieving, there are no upper links in there in this pic. That is the drivers side LCA that you see in the pic. I am running the same setup as a couple other people that I wheel with, it has proven itself over time and this is the setup I'm going with. I will keep it in mind though if there seems to be wrapping when finished. 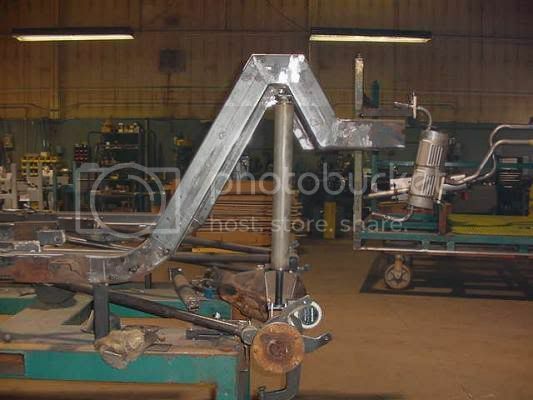 Upper arm is 25.5", lower arm is 36.0" with 4" sep at frame end and 9" at axle end. Thanks for the tip.